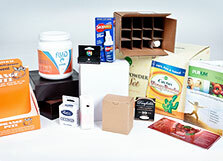 As a southern California leader in custom product packaging, package design, and package printing, PrintPac recommends strategic national product packaging vendors to supply packaging. We consider many factors including proximity to fulfillment and achieving the best possible visual, tactile, and spacial presentation. We make sure your product packaging has the impact it needs to attract the consumers' attention and gain their trust at the point of purchase (POP)... keeping costs down and profits up! PrintPac's full-service approach ensures you get the best pricing, quality, and customer service. We take into consideration your special budget requirements and handle orders of all sizes, large and small.